Did you play Velocity or Velocity Ultra on Vita? You should - right at the end of the PSP’s life and at the beginning of the Vita’s, Brighton-based studio Futurlab came up with a compact but complex arcade space-shooter that was both nostalgic in its aesthetic and inspirations and playfully modern in its mechanics. You were a tiny ship zipping through complex levels, with a short-distance warp engine that let you disappear and reappear on the screen, darting about to blast switches or rescue survivors from closed-off corners, disappearing from the line of enemy fire in a blink. It’s a classic high-speed, high-score shooter that never runs out of ideas, throwing creative concepts around with casual brilliance. Velocity 2X puts a little pilot in that little ship - Kai, a stern-eyed Samus Aran for the modern age, whose story stitches together Velocity 2X’s levels in sci-fi comic style. She can step out of the cockpit and into brief, frenetic side-scrolling platform sections that require you to be just as fast with your fingers and flexible with your thinking as the vertical-shooter sections. Where the original Velocity could confidently transform from vertical shooter to puzzle game and back as the level design demanded, Velocity 2X adds platforming to that mix, making it a fusion of three distinct but instantly recognisable gameplay styles. It speaks the same primal game-language as so many arcade classics that anyone with any kind of history with video games will immediately know what to do in a given situation. You’re in a corridor! Run right and jump. Cascading alien ships incoming! Shoot ‘em from below. Something’s sparkling in the corner of the screen! Get over there and collect it. It means that Velocity 2X feels intuitive despite its layered complexity. It introduces new mechanics just as you’ve gotten comfortable (or even speedy) with the existing ones. The original Velocity’s Galaga-throwback, sprite-led retro graphical style has evolved into a slick, futuristic look that better befits the big screen on PS4, but still looks at home on Vita. There’s intense, constant visual feedback - things are always exploding. The coruscating 16-bit score has also enjoyed an HD remake - now it’s a pulsing, neon, modern electronic soundtrack that infests the brain and helps gently pull you into that feeling of flow. 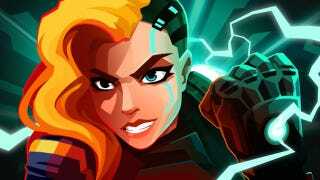 Velocity 2X really comes into its own as a speed-run game, a high-score game - no sooner have you finished one of its levels than you’re itching to go back and do it faster, collect more survivors, do it perfectly. It’s not really a twitch shooter, Velocity. You can take a few hits before exploding, walls can’t hurt you, and usually you are focused on figuring out the situational puzzle in front of you rather than shooting things or avoiding things. It’s once you’re familiar with a level that it transforms into a time challenge - that warp mechanic allows you to almost remix the levels once you know what you’re doing, shaving entire seconds off your time. Velocity 2X is one of the more inspiring products of Sony’s close partnership with indies - this is a game that’s gone from PlayStation Mini to PS4 sequel in the space of, what, two years. It’s beautiful, frenetic and addictive, and as soon as it’s out on PSN it will instigate some of the great leaderboard wars of our time.